Boil meat and cut into thin strips. Cut green radishes into thin strips, soakin cold water for 10-15 minutes and drain. fry thinly sliced onions in oil. Combine meat, radish, fried onions, mayonnaise, salt and peppper and mix. 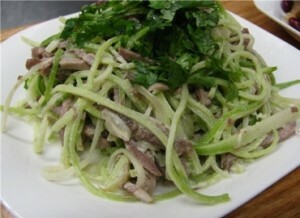 To serve, make a hillock in salad bowl, garnish with quartered boiled eggs, strips of boiled meat, and chopped green onions and green. Top ech serving with a coating of the remaining mayonnaise.